Age: The well-patterned wing coverts and undertail coverts suggest a 1st cycle large gull. Zooming in, the primary tips are pointed, also supporting a 1st cycle bird. Note that the dark gray feather splotching along the upper flanks, breast and hindneck, is presumably from a post-juvenile molt. These feathers are thought to be from the same molt that produced the post-juvenile scapulars seen here. Bear in mind that all the visible scapulars have been renewed (i.e., formative). The tertials and upperwing coverts are juvenile (i.e., 1st basic). Identification: We can immediately rule out all white-winged species as none have primaries this dark in 1st cycle, coupled with renewed mottled scapulars. All of our large gulls begin with pink legs, so leg color is of no value here. 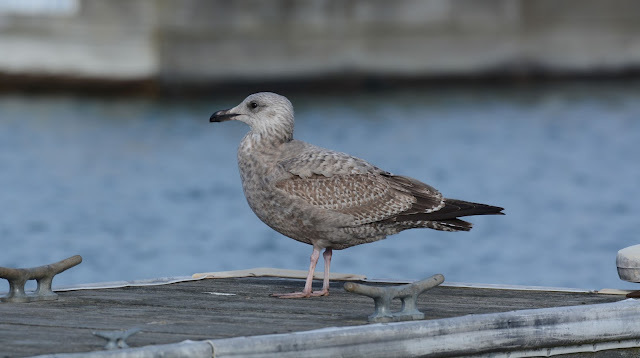 Note that California Gull can superficially resemble this, but the wing projection is typically longer (difficult to ascertain from a single photo), the rear is sleeker and more attenuated, and the body doesn't appear as heavy. The bill is starting to pale and the overall size/proportions point to a standard American Herring Gull. The pale head with contrasting dark body is fairly common in this age group, quite early in the season. Our January Quiz is indeed a 1st cycle Herring Gull. Winthrop Harbor, Illinois. November.